The majority of existing blocks of flats only have one extract air ventilation system (F-system). In cases where no supply and extract air system (FTX) exists, there is an option to recover energy from extract air. 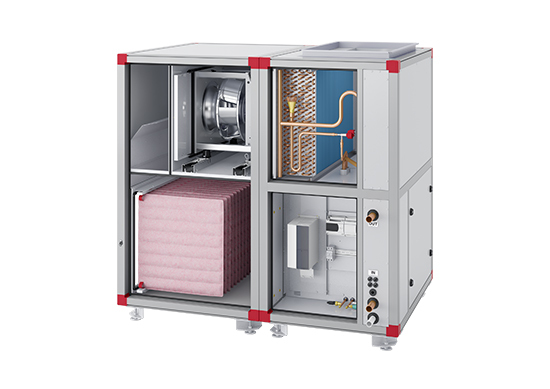 EcoHeater is an extract air unit with integrated heat pump. The compressor is speed controlled via a frequency inverter, which means that EcoHeater is constantly adjusting in relation to the amount of energy that is available to recover. When tenants cook or take a shower, EcoHeater also recovers the extra energy that arises as a result of a higher moisture content and increased air flow. This is unique to EcoHeater. EcoHeater is simple to install and offers substantial energy savings. When we develop products, we place great emphasis on making it easy and cost effective to transport them into buildings. Where physically possible, we have made the module elements so short that they can enter through a 900 mm opening. We hope this will make it easier for you to get the unit into the building, and even into narrow lifts. Property owners wanting to recover energy from extract air have traditionally been advised to purchase a heat pump and extract air unit separately from different suppliers. 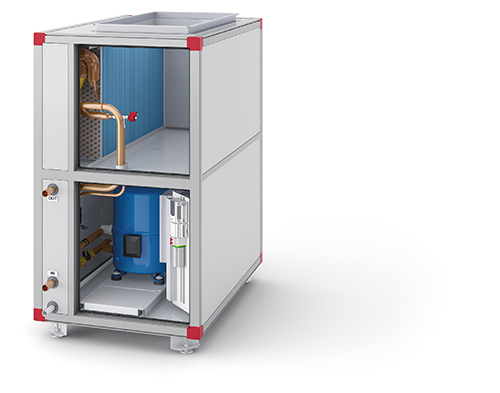 With the new EcoHeater, we have created a prefabricated and highly efficient extract air unit with integrated heat pump. What you get is a complete unit from one supplier, with control equipment custom-designed for apartment buildings. The compressor is speed controlled via a frequency inverter, which means that EcoHeater is constantly adjusting in relation to the amount of energy that is available to recover. When tenants cook or take a shower, EcoHeater also recovers the extra energy that arises as a result of a higher moisture content and increased air flow. This is unique to EcoHeater! The EcoHeater creates heat and is connected to the district heating station in series. The EcoHeater creates heat and is connected to the district heating station in parallel. Domestic hot water will also be connected to the system in a future stage. EcoHeater provides both domestic hot water and heat, prioritising domestic hot water. The EcoHeater is connected in parallel to the radiator circuit. The Skvallertorget housing association in central Kalmar wanted to improve energy efficiency at the property and chose EcoHeater. All 17 stairwells with 10 storeys in the Andersberg district in Halmstad have been fitted with EcoHeaters in stages. The entire range has integrated control equipment with software developed by us. We use Siemens Climatix hardware. The control equipment gives you over 100 standard features to choose from so that you can optimise according to your needs. Air flow rates and temperatures can be optimised simply. The units can be connected to the Internet, IV Produkt Cloud or parent system (BMS) via most communication protocols. Project-specific electricity and control schedules included in the delivery. The unit has been function-tested and is ready to be commissioned. Energy Watch gives you control over your kilowatt hours! We offer an option to help you stay in control of your kilowatt hours in the form of our proprietary Energy Watch function. Energy Watch is a unique function for monitoring and optimising the energy consumption in the air handling unit. You can easily see the meter values and information in the hand-held terminal or in a parent system. A quick guide to the hand-held terminal and instructional videos will help you get started. Through product development, we are constantly improving energy optimisation in our air handling units. As part of this work, the range has been fitted with well-designed casing with a good fit and high energy performance. Doors and panels are manufactured in double sheet metal construction of aluminium/steel zinc-treated steel sheeting with ALC protective coating, which complies with the requirements for corrosion class C4. Some parts of the unit can be manufactured in different materials, e.g. stainless steel 2343. The product selection program IV Produkt Designer offers the option to choose cabinets and panels in fire class IE30. Innovative solutions mean we can offer units with very low heat loss. 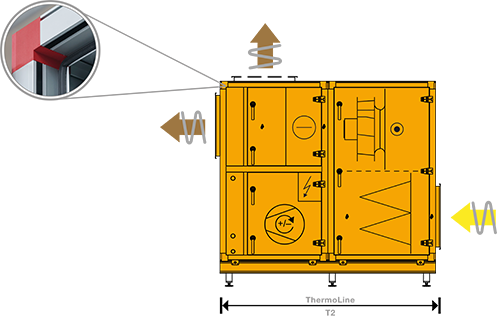 According to the EN 1886 standard, the classification of the casing is determined by the U value. The lower the number, the better the insulation capacity. Multiple versions of the casing are available. The standard version is classified under casing class T3, which has a U value of 1.24*. For the best energy performance, you can now also choose ThermoLine, which is a class T2 casing and has a U value of 0.88*. A casing class of T2 reduces cold bridges. In fan rooms with high air humidity, this reduces the risk of condensation forming on the unit casing. The black plastic insert in the profile breaks the cold bridge and is characteristic of the ThermoLine – T2 casing. A major advantage of the newly developed casing design is that it allows us to offer different energy classes. ThermoLine – T2 offers energy savings while also reducing cold bridges. The risk of condensation forming on the casing is reduced and this represents a major benefit, e.g. in connection with installation in a cold and damp attic. The series is available with a wide selection of direct-driven fans and motors in order to optimise the efficiency of the fans and minimise electricity consumption. Each fan impeller and motor is balanced and test-run together to guarantee function, ensuring a long service life. The direct-driven fans are intended for variable speed control. Fan impellers have airfoil blades and rotating diffusers, which gives low noise and high efficiency. External combustion gas fan is controlled and exercised via EcoHeater. Extract air fan as a combustion gas function. The fan is able to withstand 1 h at 70 °C. Damper opens for bypass via filter in the event of a fire. Extract air fan as a combustion gas function. The fan is able to withstand 1 h at 70 °C. Internal damper in module section opens for bypass via filter in the event of a fire. Duct connection for bypassing the heat recovery coil is available as an option for the EcoHeater. Can be used in the event of fire and when the heat pump is not operational. IV Produkt Designer is a product selection program designed for IV Produkt’s air handling units. The program generates unit drawings and information on performance, which can be exported to various CAD applications in the form of intelligent files. Download brochures and technical documentation in our document portal. Here you can also find questions and answers as well as a knowledge bank where we publish tips, recommendations and more.